There was no question that each and every one of the 22 drivers in Saturday night’s NASCAR Whelen Southern Modified Tour race at Bowman Gray Stadium wanted to win it. The race was quite possibly the biggest race on the inaugural Tour’s schedule and one of the most prestigious, coming at one of the most historic tracks in all of the country. Not to mention, everyone knew there would be a ton of NASCAR representatives at the track, thanks to the significance of the event. There were probably a few drivers who might have wanted it even that much more. Both Burt and Jason Myers are Stadium regulars whose family has significant history at the track. Then there is Junior Miller, the “King of the Southern Modifieds” and a multi-time Bowman Gray track champion and a fan favorite. Then there are Tim Brown and Michael Clifton, who are also regulars who know what Bowman Gray means to anyone in the Southern Modified community. On Saturday night, that little extra bit of determination might have made all of the difference. Burt Myers put on a spirited battle with Brown lap after lap, finally took the lead on lap 138 and held on to win his second Southern Modified Tour race of the season. In Victory Lane, Burt’s enthusiasm and celebration showed just how important the race win was to he and his family. In fact, it was the Myers family’s 101st career feature win at the famed quarter-mile track in Winston-Salem (NC). He could hardly put the win into words. “This place is tough on you mentally and physically. I’m ecstatic. I can’t even put it into words right now. There is so much going through my head, but I can’t even put it into words right now. 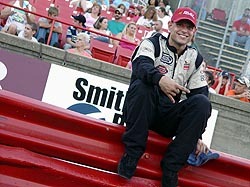 The Myers family has been part of the scene at Bowman Gray from the start. Billy, Bobby, Burt, Jason and Gary Myers have all won races at the fabled track. In fact, the car Myers drove to victory Saturday was originally built and raced by his father, Gary, in 1986. The race car has now won 45 races in the past 19 years. “I wanted this one really bad it being a (NASCAR Southern Modified) Tour race,” said Myers. “The fact that silently, the tour and over here have always been separated. They tried to run a Tour race over here one time, but the stadium didn’t acknowledge it. SMART did, but the track didn’t. So to combine the two and know that everything we’ve worked for over the last couple years with SMART is finally starting to pay off. Not to take anything away from SMART, but we needed someone to take it to the next level and that is what NASCAR is doing. like Don Hawk and a lot of representatives. Hey, you really couldn’t ask for a better night. But nothing happened to Myers on Saturday night. The older of the two current racing brothers won the pole on Friday night in qualifying, but redrew the fifth-starting spot. Jay Hedgecock, who qualified second, started on the pole and took off, literally. Hedgecock, not one of the normal Bowman Gray regulars, pulled out to a huge lead on the start and led the first 71 laps and survived an onslaught from Brown through a variety of cautions. However, on lap 72, Hedgecock’s bad luck of the 2005 season caught up with him again. As his #41 came through the corner, some dirt on the track, kicked up by another car who briefly got off track, caused Hedgecock’s car to nearly spin and head toward the wall. Brown got around Hedgecock for the lead, while Hedgecock gathered control of his car before getting into the wall and falling back into spot fifth in line. Myers got to take the checkered flag around BG for a Victory Lap. Check out the front bumper on Myers' #1. He used it well. 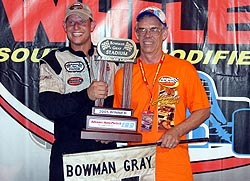 That set up a battled between Brown and Myers, two of the most loved and hated drivers at Bowman Gray. Myers appeared to be the fastest car between the two, but couldn’t make the pass. 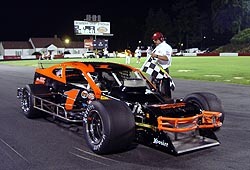 And in typical Bowman Gray style, Myers beat on Brown’s rear bumper lap after lap, but couldn’t do anything with him. Brown and Myers continued to battle until Myers finally made a move on Brown on lap 137 and took the lead with a very clean pass on Brown for the eventual win. 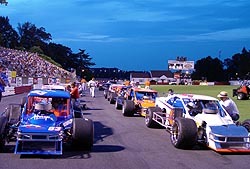 Tim Brown (#83) and Jay Hedgecock (#41) led the field to green at Bowman Gray and both played a key role in the race. but I knew I wanted to be in the top three when I was getting ready to make my move. I guess Hedgecock hit the dirt and lost it and that put me to third. I thought if I can just pick off one and take my time, pick off another and pick off another I’d be fine. “I knew if I just took my time to get to the front, that when I got ready to go, I’d have something left. I think had it not been for that green-white-checkered, I could have put some distance on them. Brown was disappointed in second, but he wasn’t upset about Burt’s driving style. Brown had one more shot at Myers after a late caution brought out a green-white-checkered finish. He gave it all he could, but couldn’t make the pass work. Junior Miller showed his #69 Advance Auto Parts car was fast, coming home third. Hedgecock came back to finish fourth, with Clifton fifth. But in the end, the night belonged to Myers and his entire family, even if the fans like it or not. And even an hour after the event, Myers still couldn’t put the meaning of his win into words.